The Luther Memorials in Eisleben and Wittenberg bear testimony to the Protestant Reformation. These two towns in former Eastern Germany are closely related to the lives of Martin Luther and his fellow-reformer Melanchthon. The site includes the houses in Eisleben where Luther was born in 1483 and died in 1546, his room in Wittenberg, the local church and the castle church where, on 31 October 1517, Luther posted his famous '95 Theses', which launched the Reformation and a new era in the religious and political history of the Western world. Driving from Quedlinburg to Eisleben, the landscape changes. First one comes across a very large modern windmill park. 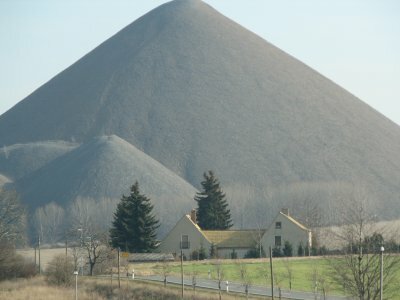 Then there are man made hills, like tumuli: the remains of the mining industry. This area already was used for silver and copper mining during the 15th century, when Martin Luther was born here. Luther’s father worked in the industry too. The town of Eisleben looked extinct when I explored it on a Saturday afternoon. Fortunately I did find a few signs posting to the Luther sites: the statue on the Market, the house where he was born and the one where he was buried. Two churches in town also have Luther connections: in the Church of St. Peter and Paul he was baptised, in the Church of St. Andrew he preached for the last time (just 3 days before his death). Luther’s birth house is undergoing restoration at the moment (until March 9, 2007), both on the inside and outside. I did visit the small museum in the house where Luther died. The bed where it happened is still there (ahum, probably a replica). On the first floor a number of early Bibles in the German language are exhibited. 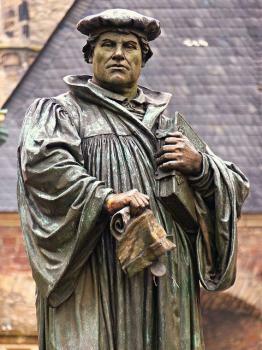 They reflect Luther’s work in translating the Bible from the Greek into vernacular German. Also the role of the printing press which enabled to spread ideas far more quickly (a similar revolution as the internet nowadays) is highlighted. The level of authenticity of these buildings in Eisleben is rather questionable. They all have been heavily restored or partly rebuilt over the centuries. The ICOMOS report mentions that their spiritual meaning has to be taken into account too. In this, it is a rather unique WHS – not rewarding what is left but what once was. I was thinking at first that it would be more appropriate to put this site on the list of intangible heritage (‘Memory of the world’), but a WHS like Lumbini has the same ‘problem’. Both places do give you a feeling though for ‘where it came from’ by showing the beginnings or living circumstances of important historical figures. P.S. : Not part of this WHS is Wartburg castle, where Luther stayed in hiding for a year and translated the New Testament in German. A possible extension? By total accident I paid my second visit to Wittenberg, Germany, on October 31, 2017, the day of the 500th anniversary of Reformation. The navigation through the packed streets were very difficult, but I at least visited the 4 properties again so far included in the Wittenberg portion of this WHS. The extension has been proposed for this site. 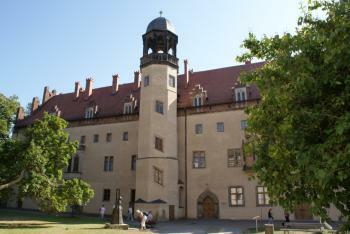 The photo is the Castle Church, to a door of which Luther nailed his 95 theses. On this day the people seemed most interested in seeing President Steinmeier and Chancellor Merkel, lining up behind the police fences for hours and hours. This anniversary had more like a party atmosphere than a solemn one. I guess after all this was the 500th birthday party for the Protestant Church. This is one of those WHS's where the reason for inscription is actually more about something that is hard to physicalise... so they just create a reason to use some buildings to represent the idea. As a result, I found it rather unimpressive. Obviously the history of Martin Luther is extremely significant and the bonus of visiting the places included within this site is that you learn a lot about it. It wasn't a topic I knew a huge amount beforehand, so I appreciate that. However, I felt more like I was in a series of museums rather than seeing something of actual historical and cultural worth. Personally, I found Wittenberg to be more enjoyable than Eisleben - but it was also a much more touristy town and there were a lot of people around. Still, everything in both sites is done very well and if you know what to expect, I don't think you'll be disappointed. I visited this WHS in November 2014. I visited both Eisleben and Wittenberg. I decided to sleep over in Wittenberg as there's much more to see and do. Before the 500th anniversary of Reformation in 2017, however, I'd suggest you focus most of your visit in Eisleben. It lacks the tourist groups of Wittenberg and everything is open and without scaffolding. I visited Luther's birth house and the church where Luther was baptised. The interior of the church has been completely restored and given a modern touch with a "jacuzzi-like" baptism font in front of the old one with ripples reflecting on the church's walls. I also visited Luther's death house which is less interesting than his birth house (the info given there is much more structured and interesting). 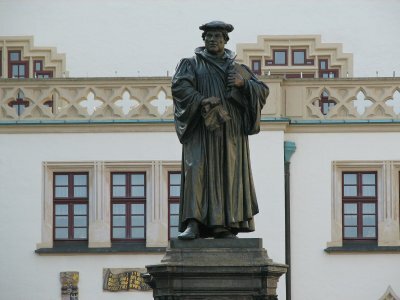 Luther's statue in the middle of Eisleben's square is particularly well made (picture). In Wittenberg, the highlight is the 95 Thesis Door (perfectly visible) and the Schloss Kirche which is undergoing major restoration works till 2017. The Luther museums in Wittenberg I found to be less interesting than those in Eisleben and most are undergoing restoration works too. If you have enough time, I'd recommend visiting Halle and it's huge church. It's well worth a visit. 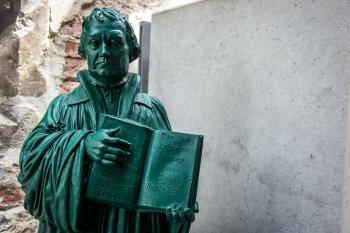 The sites in Wittenberg and Eisleben were inscribed for their connection to the life and work of Martin Luther and to the ideas of the Reformation rather than for the outstanding value of the monuments. I visited both towns in summer 2009. Both are medieval towns like many others in Central Europe, nothing special. Strangely enough, Eisleben was almost deserted, while Wittenberg was crowded with tourists, mainly from Japan and China. Probably they want to see all this famous door of the Schlosskirche. However, this is not the original from 1517, just like many of the other Luther Memorials that have been destroyed and rebuilt over the centuries. Wittenberg I liked better than Eisleben. 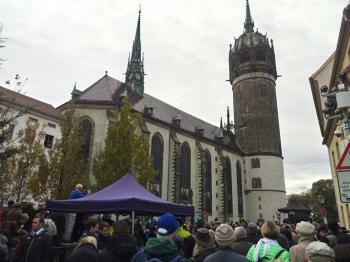 I enjoyed the walk from the Schlosskirche to the Luther House passing the main square and the worth seeing Stadtkirche. The Luther House (photo), his former residence, now houses a museum on the history of the Protestant Reformation, which is certainly fascinating when one is interested in this part of history. The Luther Memorials are not my preferred kind of WHS. So I took it as a stopover between the visits of two of my favourite WHS in Germany, the Bauhaus Dessau and Classical Weimar. I used Lutherstadt Wittenberg as a base for visiting the many WHS in the area. Trains took me as far as Bad Muskau in the east and Eisleben in the west for day trips, as well as to Quedlinburg, Worlitz and Dessau. Being rather ignorant of Luther and his activities I did learn a lot by visiting Wittenberg and Eisleben. But I wondered what the bus loads of Chinese and Japanese tourists visiting these sites made of it. Architecturally the churches are rather austere, although I did like the decorated ceiling and pulpit of St Anne's church in Eisleben. This is one of those relatively few WHS which are inscribed primarily because an event of significant historical importance occurred there (I reckon there are only about 10 of these on the list). 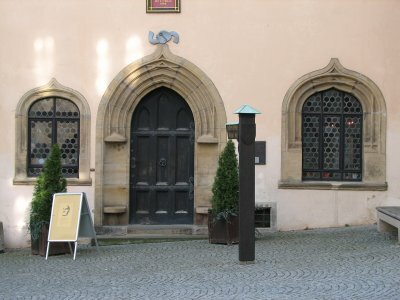 Wittenberg is one such place – seeing “that door” on the church where Luther nailed up the “95 Theses” is a very direct way of “connecting” with history as opposed to viewing a building or town/city which is just a “representative” of a style or period. In fact it isn’t actually “that door” but a 19th century bronze replacement which doesn’t attempt any authenticity and is decorated with the Theses themselves (photo) – and the church itself was seriously damaged during the 7 years war, largely rebuilt and again heavily restored late in the 19th century – but despite these changes the “link” with the past was still maintained in our mind. Wittenberg is a reasonably attractive small town but, in all honesty, is nothing special in comparison with many other central European towns with “medieval” backgrounds – Michelin, usually a good “objective” judge in these matters, doesn’t even award a single star (out of a possible 3) to the town itself. It is only raised above this average statusby its “Lutheran” connections and the inscription only includes a limited number of buildings in the town. Places where he studied, discussed and preached, together with his tomb in the Church - but not a tree marking the place where he burnt the Papal Bull! Some sites are also included which relate to a fellow reformer, Melanchthon. It is also perhaps worth mentioning that this is one of relatively few “Protestant” religious WHS (compared with eg Catholic or Orthodox). 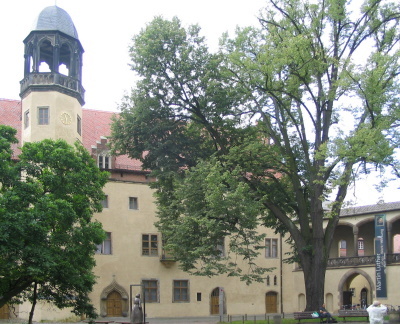 Wittenberg itself is situated in a great “hot spot” area for WHS – the German State of Saxony-Anhalt. That State alone has 4 interesting WHS within a very small area. The day we visited Wittenberg remains a bit special for us as it remains our record for “number of WHS in a day”! We were driving the long journey back from Poland to UK and had a very early breakfast in Wittenberg after sleeping in the car at a nearby rastplatz on the autobahn, took in the Bauhaus at Dessau before lunch (see my review) , Quedlinburg (perhaps the weakest of the 4?) mid afternoon and had dinner in Goslar (in a different State)! Yes, I know that is incredibly rushed. We have since revisited Wittenberg (taking in the nearby Garden Kingdom of Dessau-Worlitz – see my review) but we must return again to see the second half of the site at Eisleben. We visited Lutherstadt Wittenberg for a particularly cold November afternoon. The town itself was quite pretty but not at its best on an icy autumn day, I would guess it is a lovely place to wander around on warmer days but probably filled with tour busses. There are three places specifically associated with Luther; the Stadtkirche, Schlosskirke and Lutherhaus, also included is the house of Luther's friend and contemporary Melanchthon. The Schlosskirche had a surprisingly ornate interior for such a small protestant church, the ambience was slightly spoilt when the tour group entered all with cameras blazing. The door commemorating the nailing of the 95 theses was impressive, but it seems contentious as to whether this famous act ever happened. 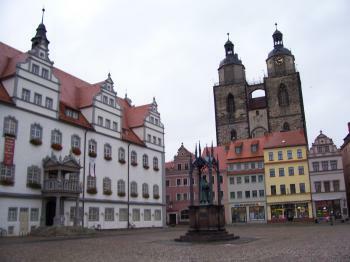 I really liked the main square (picture) and spent a fair amount of time in the Stadtkirche, it is a really significant place as this was the platform from which the first protestant lectures were delivered, it also has a fine altarpiece by Lucas Cranarch the elder. It is interesting to see on the outside rear of the church a 'Judensau' statue. It is highly offensive to Jews, and helps to illustrate that Luther preached virulent anti-Semitic beliefs. There is a monument on the ground funded by the people of Wittenberg, which attempts to come to terms with this particularly unpleasant part of their history. As said elsewhere this is an odd inscription, it is more of interest for what happened here than what still exists. It is not possible to boil the reformation down to one starting point, Jan Hus had been preaching similar things more than a century before in Bohemia, however it was in Wittenberg that the Reformation became one of the most important parts of European and World history, and it is certainly worthy of the time to explore a town that has such an identifiable place in history.